In the world of tomato -and crop- production, your harvest is only as good as the fertilizer you use to enrich and amend the soil. A fertilizer is basically a product, which can be natural or synthetic, and that is used to supply minerals and nutrients to the soil, and therefore the crops planted there. Most -if not all- fertilizers work in two specific areas. First, as I mentioned above, to supply the plant with the nutrients that are essential to its growth. And second, to amend the soil by improving both its water retention capabilities and aeration. Both of these areas are essential to the successful development of any given plant. 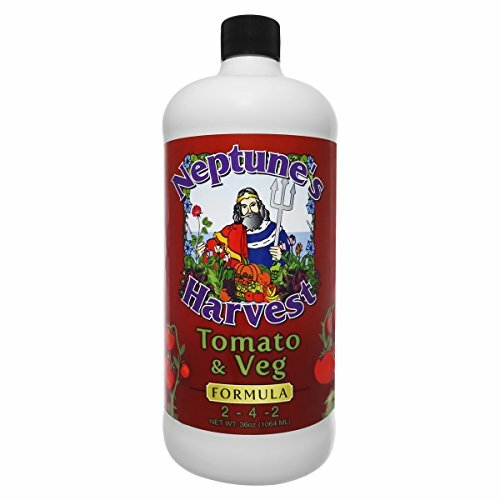 Neptune’s Harvest is a company based off of Gloucester, Massachusetts. This organization specializes in preparing and supplying all types of seafood -including the highest quality fillets, lobster, and shellfish- to major supermarkets across the United States. The fertilizer division of this company was born as a result of wanting to use each and every part of the fish, and not just the edible ones. The head, skeletons, scales and fins all make up about 70% of the fish, and would just be thrown back into the sea as waste if not for this division. ​Espoma has been in the fertilizer business for over 80 years, spanning 4 generations of family ownership. Though hailing from humble beginnings, their continued success, coupled with the arrival of automation have turned this company into a considerable force in the industry, while still conserving their core values of quality, service, integrity, education, and responsibility. 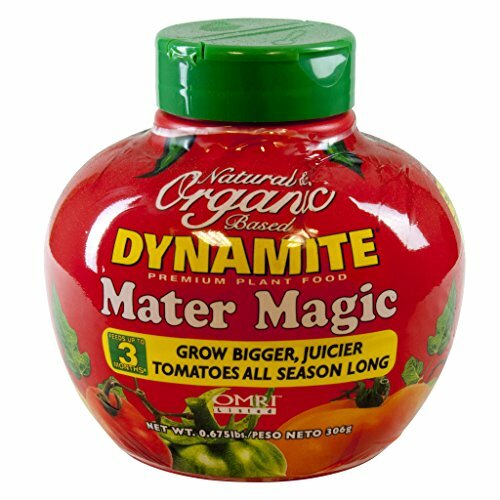 The TO8 Tomato-tone fertilizer is completely organic and is chock-full of thousands of microbes that benefit plant growth. This pellet-based fertilizer is designed for fertilizing tomato -and other vegetable- plants in a continuous fashion. The slow release mechanism of this product ensures that your plants remain fertilized for up to 8 weeks without having to re-apply it. The best part is that it is completely safe to use, so you can rest easy if you have cats or dogs that often run around your lawn; even if they come into contact with this product, they will not be harmed. 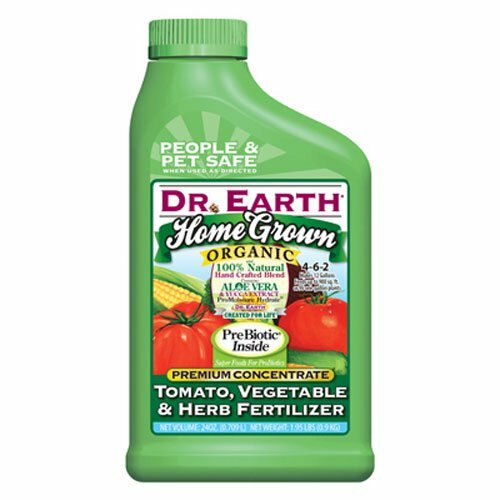 This fertilizer is also environmentally safe and causes no burning to your plants when applied properly. JR Peters was created in 1946, and has been formulating, designing, and producing all types of fertilizing products for the past 70 years. In their beginning, the company specialized in analyzing and surveying greenhouse soil samples and made relevant recommendations on how to grow proper crops to their clients. Additionally, they also provided their own brand of water-soluble fertilizers. This company works in close partnership with several big crop-growers and is constantly ahead of the curve when it comes to producing the best fertilizers using their state-of-the-art equipment and laboratories. 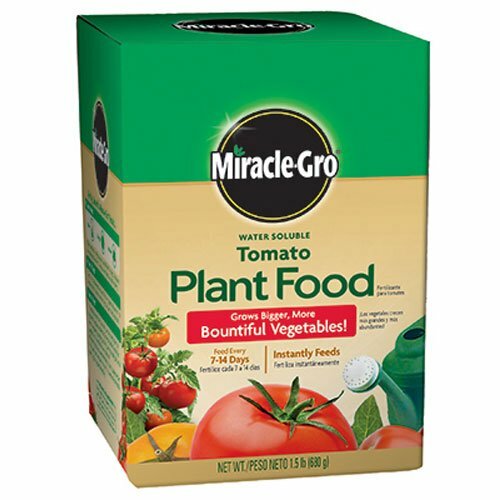 This particular product is one of the best tomato fertilizers in the business, featuring both micro and macronutrients that are vital for healthy plant growth. 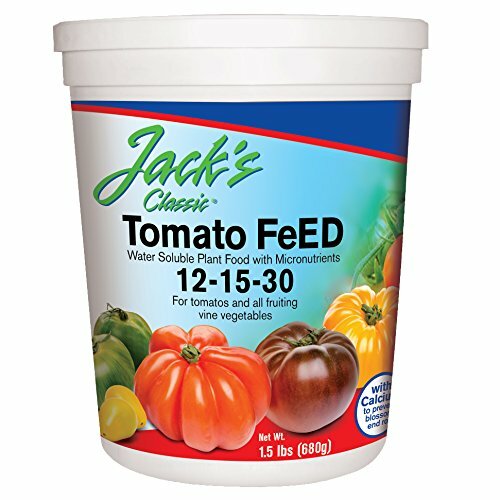 Featuring a hefty 12-15-30 NPK, this tomato feed is perfect for both boosting the health of the plants, and amending the soil so that future generations of crops can be sown in the very same spot. This product’s high potassium index is specially useful for boosting the health of the leaves and blossoms, which translates into big, healthy and green stalks and vines. Miracle-Gro merged with Scotts in 1995, becoming one of the biggest businesses in the gardening industry in the whole world. Miracle-Gro, now a part of the Scotts Miracle-Gro Company has regional offices in many countries, such as the United States and Canada, and most of Europe and the Asia Pacific region. After their merger with ServiceMaster’s TruGreen in 2015, Scotts-Miracle-Gro became the largest company in the lawn and garden industry in North America. In the United States, they are leaders in the industry, producing a wide range of products in the garden and lawn market. Their garden and fertilizer division specializes in plant feed, soil amendments, aerogarden, seed, gro-ables, and garden tools. This specific product was designed with tomato crops in mind. Its formula is designed to help tomato plants grow healthily, and its NPK ratio of 18-18-21 features lots of potassium, so that your plants stay healthy once they begin blossoming and bearing fruit. This product is water soluble, so usage is as easy as adding the indicated amount of fertilizer in your watering can, filling it up with the specified amount of water, and watering your plants as you normally would. Jobe’s Company widely known for its line of fertilizer spikes. The company’s history goes back to 1969 when they invented their first house-plant spike. As the company grew, so did their range of products and their share in the market. Nowadays, the main goal of Jobe’s is to provide organic, environmentally friendly products that can help reduce the bulk of garden work required to properly keep and maintain your plants and vegetables. While some might argue that the enjoyment of gardening as a hobby comes from tending to the garden itself, not many may have the time required to properly take care of their plants. Jobe’s brand of organic fertilizers was created for this very purpose; as user-friendly products that anyone can use in a pinch, with similar or better results than with the competitions’ products. 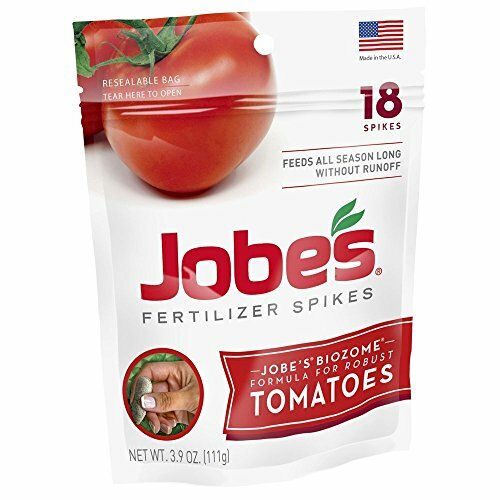 Using Jobe’s line of organic fertilizers is as easy as driving each spike into the soil where your crops are planted, and letting them do their job. Their slow release mechanism ensures that your plants remain fertilized for extended periods of time, removing the need to constantly replace them every 1 or 2 weeks. Instead, each spike can keep a plant fed and healthy for up to 8 weeks, without the need to add any other supplements or care other than their regular water. 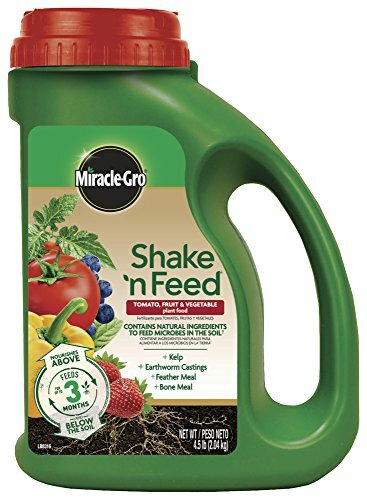 Miracle-Gro makes the list once again with this product, which is a testament to the quality behind each of its creations. This slow release fertilizer ensures that your plants stay fertilized for up to 3 months, and its formula contains high amounts of calcium, which helps create higher quality fruits and vegetables. 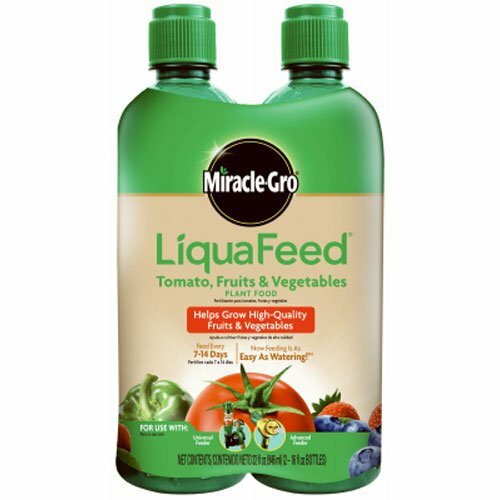 For those that have trouble properly distributing the fertilizer across their crops, the LiquaFeed fertilizer from Miracle-Gro is a godsend. The only downside is that this entry, in particular, requires you to own the Garden Feeder, as it only includes the refill packs. Once you hook this product up to your garden hose, fertilizing your plants becomes a walk in the park, or rather, in the garden. The mission of the Dr. Earth company is to improve the support of organic gardening as means to preserve the planet. Their line of fertilizers is all 100% organic. This product in specific is water soluble and can be applied by mixing it with water inside your watering can. It is completely safe for pets and people and causes no burning to your crops when applied correctly. Don’t let the short title and simplistic packaging of this product fool you. 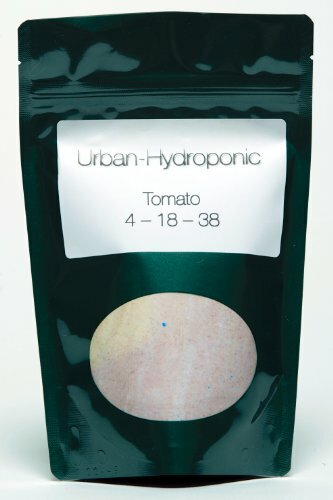 Urban Hydroponics is a company that specializes in creating products that would allow everyone to enjoy the wonders of gardening, despite adverse weather conditions. This product is designed to allow gardeners to grow their crops in a hydroponic environment, with professional results. The Dynamite brand of fertilizers was introduced to the retail market in the United States in 1990, but their history actually goes way back. They started out by formulating slow release fertilizers in Japan for their rice fields, which is one of the country’s most popular product. Fertilizing rice is especially difficult, as it requires to be grown standing in water, but Dynamite managed to pull it off nonetheless. Now, their specially formulated fertilizers are available for anyone to acquire, whether in your local hardware store, or online on Amazon or other stores. Tomato -and all vegetable plants, for that matter- have different nutrient requirements at their various development stages. In order to produce healthy plants, that yield big and juicy crops, they need to be supplied with nitrogen, potassium, phosphorus, iron, calcium, magnesium, cadmium, and many other types of trace minerals. Nitrogen will encourage leaf growth. This makes it a very important element for growing grass and lawn plants, but no so much for growing crops, as excessive leaf growth can and will interfere with blossom and fruit production. Phosphorus will improve blossoming and therefore fruit production. Potassium is a very important macronutrient once your tomato plants start bearing fruit, as their requirement for this element will increase in this stage of their lives. In essence, every fertilizer performs the very same task; enriching both the soil and the affected plants, so that they may bear fruit of better quality. However, the type of fertilizer that you will need will vary depending on several factors. In order to provide your plants with the optimal supplements for their growth, we would first need to study the soil they will be planted on. As I mentioned at the very start of this article, most plants require 3 macro-nutrients in order to grow and blossom healthily; Nitrogen (N), Phosphorus (P), and Potassium (K). In the crop-growing business, most gardeners refer to this group of nutrients as NPK, and when you actually go to purchase a fertilizer, you will see that each product has a set of three numbers, such as 2-4-1. These numbers represent the amount of NPK they offer, in that very same order. After studying the soil and determining the amount of macro-nutrients it provides, you can now effectively choose which fertilizer best adapts to its requirements by supplementing the nutrients it fails to provide on its own. For instance, if the soil can provide nitrogen and potassium, but is lacking in phosphorus, you would need a fertilizer that provides more P and less NK (i.e. 5-15-10), and so on. It’s important to note that some fertilizers also provide additional nutrients other than the basic NPK trifecta. Elements such as calcisum and iron, among others, can be used to promote specific aspects of your plants. For instance, they can be used to promote blossoming, which in turn may increase the rate and quality of the veggies. So keep an eye out for when a specific fertilizer offers these additional elements. I know that picking the right fertilizer can be a daunting task at first; there are simply too many in the market, and all of them offer different amounts of nutrients and minerals. A good place to start would be to search for user reviews on your favorite search engine, to get an idea of what product might benefit your plantation best. Remember that the idea of a fertilizer, besides promoting growth and plant health in general, is to supplement the soil’s weaknesses. With that in mind, I’m sure you will make the right choice in picking an appropriate fertilizer.